When Snapchat was first created, it lacked one component that all other social media sites were built on: the ability to post content to all a user’s followers at once. A user could send a “snap” to each of their friends individually, but they could not post to all their followers like Instagram or Twitter. Snapchat introduced a new element of privacy to social media, similar to the way one texts one person at a time. 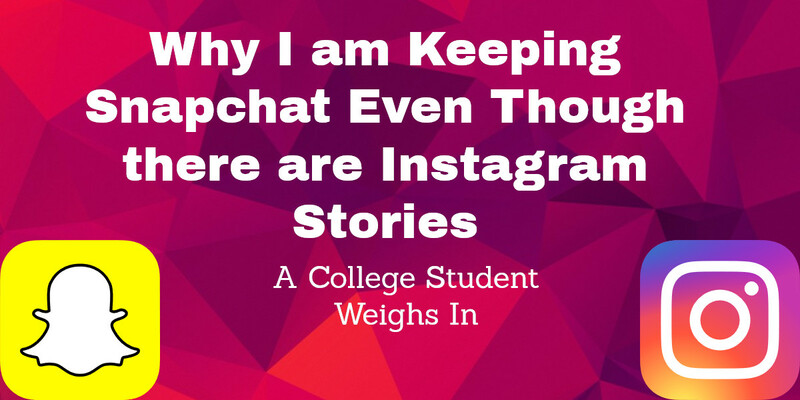 Snapchat quickly became its own breed of social media, a breed to be envied. After a while, Snapchat released the “Snapstory” which allowed users to post a picture that all their followers could see, along with a list of the followers who viewed it. The feature was met with success. Then Instagram recently launched its own version of the Snapstory. Every time a user posts an Instagram story, their profile picture pops up at the top of the app. Both versions of stories have similar features including being able to take pictures or videos and tag the location where the story was taken. Does this mean Instagram has everything and Snapchat is obsolete? Not a chance. When I first heard about Instagram stories I thought “is this allowed? Does Snapchat not have a copyright against this?”. My trepidation turned to curiosity when I opened the first story, one of the girls from The Bachelor hanging out with her other Bachelorette friends just having dinner and making all other single girls their age envious. “Didn’t I just see the same thing on Snapchat?” I wondered. To be fair, this is something mostly common to celebrities and not regular people. Many of them post the same or similar posts to all their social media accounts to increase the likelihood of their fans being able to see it. Now that it has been a little while since Instagram launched stories, their popularity has died down a bit. I see fewer and fewer Instagram stories from people I actually know in my life. After that one encounter with Instagram stories, I stopped watching them altogether. I decided that if it was not posted on Snapchat, I did not need to see it. In short, I am keeping Snapchat despite Instagram adding a story feature because, to me, they still feel like two completely different apps. Even though both Instagram and Snapchat now have a story feature, I still enjoy using Snapchat as a means of communication. Every day I enjoy waking up to articles on Snapchat from things like magazines like Cosmopolitan and People to television networks like Food Network. I enjoy sending silly snaps to my friends with filters that make me look like a dog or like I am in space. To me, Instagram has always had a more serious feel with perfectly poised photos showcasing people’s talents and interests. While Snapchat is a way to feel more like yourself and show off whatever you are doing in the moment like going to a concert or playing with your pet. I understand why people use both Instagram and Snapchat stories, but I better understand why people like myself would only use the apps for their most intended purpose. I post photos to Instagram and stories to Snapchat. On Instagram, I occasionally post comments on photos to communicate, while on Snapchat I only communicate to one person at a time. The biggest difference between the two apps is that they are just fundamentally different which makes me want to keep both.